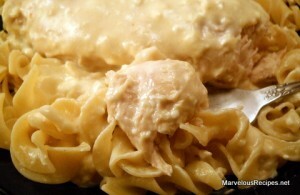 Tender chicken smothered in a rich, creamy sauce and served over hot cooked pasta or rice; and so easy to prepare! Serve with a side of Crock Pot Green Beans for a delicious meal. 1. Place the chicken in the bottom of a 3-quart slow cooker. In a small bowl, combine the salad dressing mix and water; pour over the chicken. Cover and cook on Low for 3 hours. 2. Beat the cream cheese and soup in a small mixer bowl until blended. Pour over the chicken. Cover and cook 1 additional hour or until the chicken juices run clear. 3. Serve over hot cooked pasta or rice. Makes 4 servings. I have had this…it’s quite delicious and easy to make. Oh yum that looks great and so easy ~ I love it. Thank you for sharing it. Yum. I haven’t had a hot dish like this in too long.